in the US Presidential election. According to the New York Times though, this years' must have photo call is at the Google offices in Mountain View, California. However, the candidates are expected to give something in return and have been encouraged to make speeches and take questions on their Googleplex visits. There is no doubt that being associated with Google makes candidates appear modern and futuristic. After 8 years of George Bush, the majority of candidates seem to be campaigning with some sort of 'change' message and being positioned against Google rather than GM helps to enforce their message. Its not just US politicians positioning themselves against Google to appear fresh / modern though – UK Conservative party leader David Cameron also visited Mountain View in the run-up to the proposed UK election last autumn. Republicans John McCain and Mitt Romney have used Google Adwords around topical events and news issues - with Romney particularly active against Iraq related phrases. For the Democrats Barack Obama is the only candidate to use paid search extensively, though on occassion John Edwards has bought selected phrases. 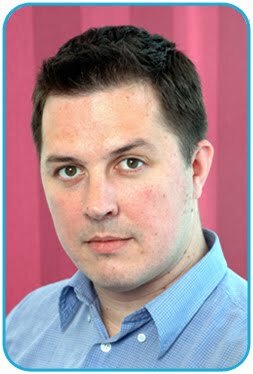 Paid Search could be utilized for topical messages too. Candidates could deliver specific messages against specific searches in the aftermath of a press conference, campaign rally or new policy announcement. As the field narrows it becomes easier to use target Paid Search more effectively as there are fewer variables, but there are still good opportunities that are not being fully utitlised. From the image results returned by Google images, it looks like Mitt Romney has also been using SEO and image optimisation to optimise images to ensure that Google always show him at his best! 2) Twitter Twitter is being used by some of the candidates. Whilst you always have to question whether the Twitterer is the person they claim to be (beware the Twitter fakes) it does look like a number of candidates are using it for real. 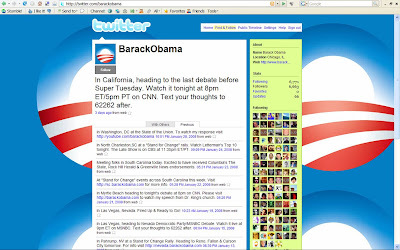 John Edwards suddenly stopped updating in November, but Barack Obama regularly updates Twitter with his movements. If he wins the Presidential race I hope he carries on. It would be very enlightening to have a Twittering President! Last year Ezra Callahan, Facebook's senior products manager held morning and afternoon workshops to show campaign staff and consultants how to leverage Facebook as part of a campaign strategy. Whilst this event wasn’t attended by everyone, most candidates have supporter pages and there are a plethora of groups based around candidates and election issues. 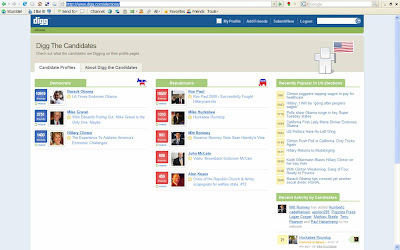 Groups are used to distribute information, drive traffic to key areas and host debate. Only 3 groups seem to have achieved significant volumes of members though – the group supporting Colberts nomination, the 'One million strong for Barack Obama' group and the 'Stop Hillary' group. Eyebrows were apparently also raised when Hillary Clinton's Facebook manager accidentally accepted a relationship request on her behalf - the request wasn't from her husband! Facebook is quickly evolving so it will be interesting to see how candidates develop their Facebook presence across 2008. MySpace TV has linked with MTV to promote MTV’s campaign called ‘Choose Or Lose’ which encourages younger voters to get involved and vote. The partnership has resulted in joint programming on MySpace TV, where users are able to ask questions directly to top Presidential candidates and respond to their answers in real-time. To finish the series they brought together a number of candidates (Hillary Clinton, Mike Huckabee, Barack Obama, and Ron Paul) in one live event and will run final questions before Super Tuesday. YouTube and online video is playing a big part in the campaigns with YouTube video debates, policy statements, viral videos and embarassing moments all uploaded for the world to see. It is yet to be seen though if 2008 will be the year that the internet wins the White House or if traditional media will again be the most important channel in the Presidential race, but significant sums have been spent on online so far and the signs are that online investment will continue. One of the advantages of engaging with "2.0" services is that other people can extend the reach of what you're doing using web mashups. For example, last week I produced a mashup that geocodes a twitter feed. What this means is that you can automatically plot tweets that mention a place on a Google map, which can then be embedded in a blog post for example. Using Obama's twitter feed as an example, here's an Obama campaign trail twitter map. Think this is really interesting and a clever mashup - thank you for sharing it! This is all fascinating. Really interested to see if it all pans out in the results. Nick, it's really bizarre, but my Dad sent me the link to this post. What a small world. Small world indeed! I recently looked into the concept of Six Degrees of Separation online whilst working on the assumption that the World is a smaller place nowadays - I guess this proves it!